Using an electric hand mixture at medium speed, cream together butter and yogurt in a mixing bowl until fully combined and smooth, and no discernible pieces of butter remain. Add 1/2 cup powdered sugar and keep mixing until smooth. Continue adding remaining powdered sugar in 1/2 cup batches. Frosting will have the consistency of a thick glaze. Use immediately, or refrigerate covered up to two days until ready to use; stir well before using. If you’re one of those people who get overwhelmed by frosting when it’s too sweet or too thick, then this light and tart yogurt frosting is for you. And even if you prefer your frosting to be over-the-top sweet and creamy, then you’ll still love this light and tart yogurt frosting. 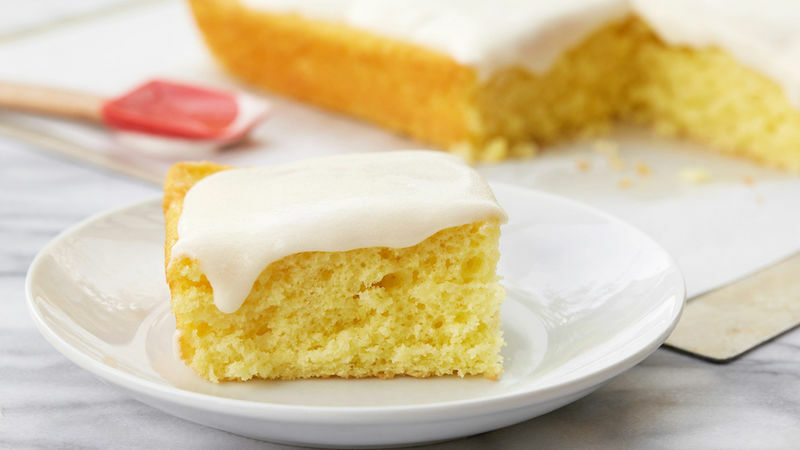 Besides its delicate texture and citrus-y taste, you’ll also find that finishing a cake with yogurt frosting actually adds moisture back into the cake which is an added bonus, because honestly, nobody likes a dry cake. And while we’re being honest, let’s just say a three-ingredient homemade frosting is just the kind of frosting we couldn’t resist. As much as we love this frosting, there’s also a place in our hearts for buttercream, whipped frosting, glaze and icing. You too? Then here are all of the frosing recipes you’ll ever need.